Alas, summer is coming to a close. The kids are getting ready to go back to school. And parents are anxious to get the kids back in school. But what does that mean in the world of farmers markets and food? It means squash, zucchini, eggplant and tomatoes are everywhere! Fortunately, these crops thrive in the heat and, since we haven’t had much rain this summer, they are abundant. I’m not complaining, really, but I am thinking about how nice it will be to have access to greens again. Kale, Swiss chard, spinach, lettuce. I will be grateful when the weather cools off and we can enjoy the fall harvest. But, until then, what do you do when you have a generous amount of eggplant, zucchini, squash and tomatoes? I was wondering the same exact thing since I have plenty of all of these ingredients. While going through my stacks (and stacks) of magazines from the beginning of the year, I pulled one page of recipes from the May 2012 issue of Bon Appetit where I had “great company dinner menu idea” written on the top right side of the page. The menu featured a roast chicken with rosemary, lemon and honey; tomato salad with shallot vinaigrette, capers and basil; eggplant and zucchini in tomato-garlic sauce; roasted peppers with nectarines; and cherries in almond syrup over Greek yogurt. Since I am not on a Greek island nor am I even on a boat, I decided to test the eggplant-zucchini recipe since I had everything I needed–with the hope that it would make me feel like I was cruising the Aegean sea. 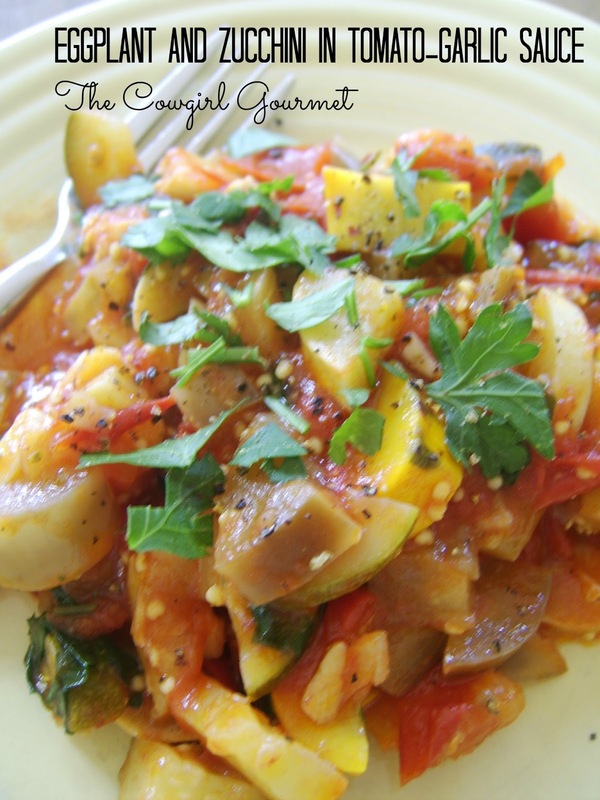 Similar to a ratatouille–but without bell peppers–and a close relative to Mexican calabacitas–but add eggplant and hold the cilantro–this eggplant and zucchini with tomato-garlic sauce is a lovely combination of flavors and textures that scream summer. And while I do enjoy the fruits of the summer sun, I’m primed and ready to bid it farewell and welcome cooler weather, jackets and greens. This summer side dish is perfect for a get together. It takes 30 minutes to put together and the ripe tomatoes and sliced garlic combine beautifully with the sauteed eggplant and zucchini. Once they meld for a bit, it becomes even more robust, flavorful and hearty. Serve with grilled meat and salad for a casual (or elegant) gathering of family and friends. Heat 1/4 cup oil in a large heavy skillet over medium heat. Add shallot and cook, stirring often, until translucent, about 2 minutes. Add the sliced garlic and cook until the edges just start to brown, about 2 minutes. Stir in tomatoes, 1 teaspoon salt and bay leaves. Cook, stirring often, until the tomatoes start breaking down and get super juicy, about 5 minutes. Add eggplant and cook, stirring often, until it begins to soften, about 5 minutes. Stir in zucchini and cover pan. Reduce heat just a touch and cook until vegetables are tender, about 10-15 minutes (or more depending on the density of your vegetables). Season to taste with a bit more salt and stir in 1/4 cup parsley. When ready to serve, add some freshly ground black pepper and garnish with remaining 1/4 cup parsley. Drizzle with olive oil.